Facing four defenders honed in on him at the edge of the area, the Argentine lured them toward the center of the field before a sudden change of foot and acceleration left one man on the turf and the rest out of position. Messi then fired a right-footed shot in off the far post for the 16th-minute equalizer. Jordi Alba provoked an own-goal from Jorge Pulido and set up Luis Suarez to make it 3-1 with the first of two goals for the Uruguay striker. Another slip in concentration let Alex Gallar score again for Huesca to make it 3-2 to Barcelona at halftime. In a lopsided second half, Barcelona's Ousmane Dembele and Ivan Rakitic scored before Messi got his second goal and then assisted Alba. Suarez rounded off the easy win by earning and taking a penalty in stoppage time. 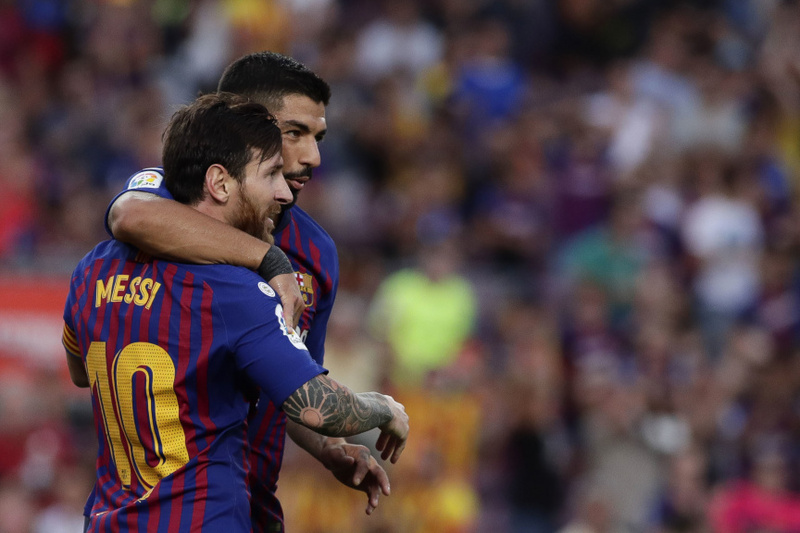 "It burns to concede a goal on the first attack since it makes you think that you started the match far too relaxed," Barcelona coach Ernesto Valverde said. "Huesca gave it its all, but we found our short-passing game and ended up doing a lot of damage." Messi's brace left him level with Karim Benzema as the league's top scorers this season with four goals each. Barcelona and Real Madrid are the only two teams to have won their three opening league games. Veteran forward Joaquin Sanchez went on as a late substitute and headed Real Betis to its first home win over crosstown rival Sevilla since 2006. The 37-year-old Sanchez scored in the 80th minute to secure the 1-0 victory at Benito Villamarin Stadium. Sanchez had missed the first two games of the season due to injury after having an excellent campaign in 2017-18. "This is a dream debut for the season," Sanchez said. It was Betis' first goal of the campaign. Valencia started this season with the two objectives of doing well on its long-awaited return to the Champions League and maintaining a top-four finish in Spain. But three matches into the season and Marcelino Garcia's team has yet to win. Valencia twice had to come from behind to salvage a 2-2 draw at 10-man Levante, its crosstown rival, on Sunday. Roger Marti scored both goals for Levante, with Denis Cheryshev making it 1-1 before Dani Parejo split the points by converting a penalty early in the second half. Levante's Coke Andujar picked up a second booking in the 76th. "We have conceded five goals in three games," Marcelino said. "I don't like my team when it doesn't have the ball." The video assistant referee awarded a penalty in favor of Espanyol and annulled a goal by the Barcelona-based side in a 2-1 loss at Alaves.